"HYMN: For the Men at the Front"
For many years after the First World War, students could walk by the entrance and see the former memorial trees planted along Fernwood Street, trees that represented those who had died in the Great War. During the summer of 2012 and the construction of the new Fairey Tech building, those same trees were taken down, and new saplings were planted during the Remembrance Day assembly that following winter. This project will inform the Victoria and Fernwood community about the richness of their history. The Vic High Student Archive Team and the Vic High Alumni are bringing the memory of those soldiers – and those trees – back to life. Many people may see this project as a metaphor for rebirth. Over the years, those trees grew and came to be strong, maturing into grand old trees. Those trees grew, however, unlike the young soldiers who had enlisted and never got the chance to reach their full potential in life. Through this project, we are honoring the memory of the trees and the soldiers, a kind of regrowth process. The removal of the original memorial trees was similar to a death, but since the replanting of those saplings, The Vic High Student Archive Team and the Alumni have begun the cycle of life all over again for the fallen soldiers. The Great War was where many had risked their lives, and this project highlights those sacrifices, and those triumphs in which many Canadians, including Vic High students, shared as one nation. 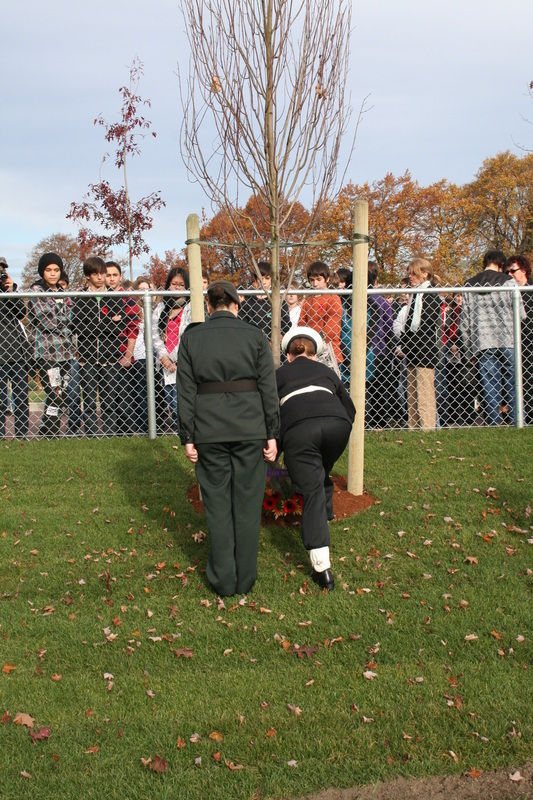 Re-Planting of the new Memorial Trees, November 11, 2010, Remembrance Day ceremony, Victoria High School.